It was her first time competing at the National Association of College & University Food Services (NACUFS) National Culinary Challenge. And if University of North Texas (UNT) Chef/General Manager Sarah Kettelhut has it her way, it definitely won’t be her last. Kettelhut, along with five other regional culinary competition winners, squared off at the NACUFS National Culinary Challenge that was held on July 11 as part of the groups’ national conference in Providence, Rhode Island. Her original dish, the Ocean Wave, comprised of Rhode Island clams in bacon cream, sautéed squid and crispy gremolata oysters with potato ribbons and campus-grown Swiss chard sauté, earned her a silver medal. Chefs were tasked with preparing a creative entrée featuring the mandatory combination of Littleneck clams, whole squid, and oysters. In addition, the competitors were judged on two classic knife skills. Contestants received final scores based on the taste of the finished product, the demonstration of cooking skills and culinary techniques, as well as the practice of organizational skills, including sanitation principles. Kettelhut earned her spot at nationals thanks to her first-place finish at the NACUFS Southern Regional Culinary Competition that took place on March 8 in Denton. She was the lone female competitor to advance to nationals from the six-region field. Although her time at the conference was brief, Kettelhut said she enjoyed the experience. 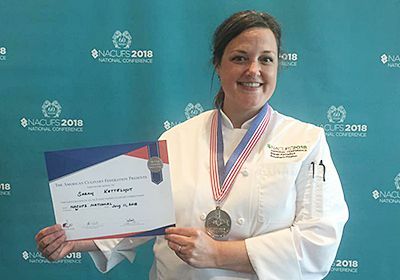 The National Culinary Challenge marked just her third time competing in an event sanctioned by the American Culinary Federation (ACF). She now has three silver medals to show for her efforts with plans to continue competing. Her eyes are clearly set on securing gold. Until then, students, faculty, and staff on campus, as well as the Denton community, can enjoy her award-winning cooking at Champs Cafeteria near Victory Hall and Apogee Stadium when the fall semester begins in late August.